I have gone by many names. Hello Everyone.. thought I would post some photos taken from my newest park I just started on for the year.. Silverwood. Yes I know theres a Silverwood park already. But I still like the name as its modeled after Silver Dollar City. 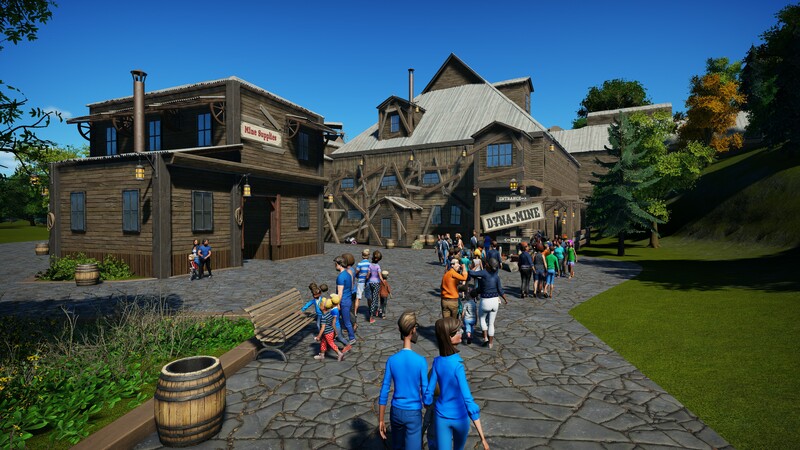 and Dollywood.. with a Rustic mountain theme. So far I've only been working around the entrance area but I got lots of ideas to put into it so this is just a start. those who enjoyed my Crystal Gardens park (available on my workshop now, but you gotta be on my steam friends list to see my workshop stuff) I think will enjoy this one even more. Upon entering the park you are greeted by a nice little rustic Gazebo that I feel really sets off the theme. and surrounded by other shops and buildings that capture the spirit of its theme. So far the biggest attraction built for guests is our River rapids..
Those are some nice buildings, some of them a bit technical. But what I really like is the water mill, not just the nicely done mill race but also how you incorporated the raft ride into the spillway for the dam. Cool idea I might have to steal someday. Yay, a new rustic mountain park! I love these (in real life and on SGW), especially if one can feel the fresh air and the special atmosphere already just by watching the pics. You made a good job there! Oh, Shadow, this is wonderful! I love the architecture. Your roofs are really, really nice. love this park. clean lines and a very structured manicured look. Thanks for the awesome comments so far guys. I really appreciate it. More to come soon. Going to build on my twitch channel later this afternoon. Also Fisherman.. if you are interested in maybe taking the park for a bit later on when I start getting it built up a bit. I'd welcome that. This is stunning! Loving the rustic archi and the ambiance. Also....how in the world did you do that trick with the river ride rafts? That's a great innovation. Thank you Lux. In order to do it you must first have a piece of river rapids ride track that was bent downwards before Frontier removed the option (Freedom of creativity.. right?) Then put the station underground. I learned the trick from Rubletrillions on his recent Brocoaster episode. Luckily.. I already had track like that for waterfall creation. I'd be honored to add some Fisherman flair in the park someplace! OH and I also have a bend in my flume track from when we could bend it. I have a double dip drop that would no longer be possible now. Glad I saved it! Very beautiful! I like how the river rapids appears to be an actual river. This effect is really emphasized by the bridge which looks awesome! Well done! This is beautiful. Very nice work! I am excited to see more! Ok everyone.. got some awesome new photos to share with you.. a few changes. and some new stuff. Finally decided on a color for the Guest Services building..
My plan is to add little details everywhere I can.. like this. Just to give the park a bit of flair and atmosphere. Heading to the right side of the park.. a better look at the Ice Cream parlor and Sugary sweet shop. Didn't show this building in the first update. Must have missed it.. Going to be a small dine in restaurant. As we head towards the parks first coaster.. heres a glimpse of a whole new section of the park coming.. Taking the path around... looks like construction fences on the other side here..
And here she is.. The first coaster to be added to the park.. Mustang. A Mack Multi Launch family thrill coaster. After the first launch.. it makes a small helix dive down the hillside towards the river. Here the parks Paddle Steamer Showboat happens to be passing by. And before we go... another glance at the next update. ALso.. if you haven't subscribed to my youtube channel yet.. heres the next two videos from the park including a POV of Mustang. Just wow. This park is one of the reasons why SGW rocks. I love how you pay attention to the details, it all feels so real as if the park was actually existing. I especially love your buildings and planters. Mustang looks like a great coaster. But I must say the overall look of this park, the landscaping, attention to detail, and most of all, the beautiful architecture, make this some of your best work yet. Really, really outstanding job! Thanks. and to think I'm actually just getting started on the park this is just the entrance area and a little bit of another. There's still so much more to come. Also @Fisherman Yes.. of course I would love for you to create a little something in the park. I''ve got JLWgames taking a crack at something first. But I've not even gotten to the point where he takes the park yet. Once I get to the point its ready. I'll get in touch with you. To everyone else I really appreciate the comments. I'll have more to show next week. Welcome back to Silverwood everyone... more updates of construction. First up!.. A couple of slight changes to the skyline. I'll let you see if you can spot them. Moving on from there.. let's go check out the new area for the Park. The County Fair. I'm still loving this Carousel Cover. Entering into the area you get a nice overview of a few rides. From the back of the area, looking to the front. We see here the Flying Swings which is the centerpiece for County Fair, as well as a QSR on the right. Looks pretty busy.. wonder what they are serving? I worked on the park a bit more on Monday, and then handed it over to JLW games who's going to work on a little something for the park over the next few weeks. I love the idea of the dueling log flumes. I don't think I would've ever thought of that. The entrance gate to the chair swing looks great as well. In fact, this whole area looks great. 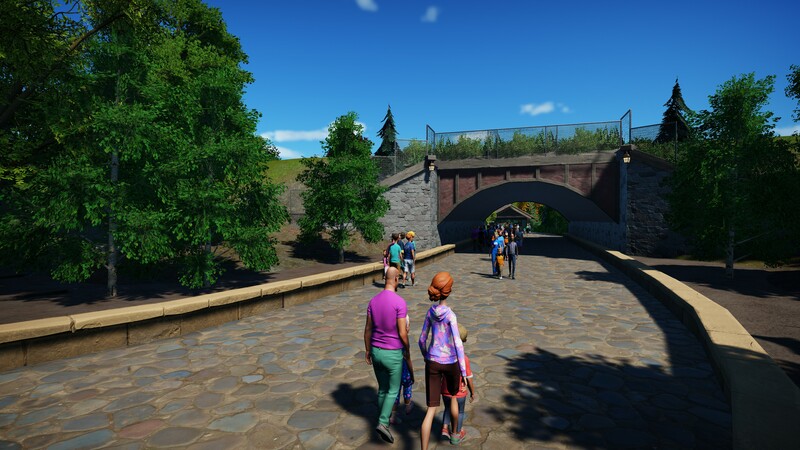 Wonderful progress on the park Shadow! I hope you dont mind im grasping some inspiration from your park for my own. Love it, especially the little farm looking area. I have always had my list to do a farm themed area of some sort. I'm loving all the details you've added. I see lots of new foliage. Really looking like a real park. Thank you everyone for the kind words really makes me enjoy the work I put into my parks even more knowing its appreciated, even if only by a few. Also I know there are some spots in the photos that can still use more work. Keep in mind I'm still building none of this is finished product. Theres always more to add as I go. More foliage, more curbing.. more little things like that. I so much like your building style! Its classic, very beautiful and so full of life! The architecture of the buildings is very much outstanding! Mustang is an awesome coaster, I liked the video very much! Hope to see more soon! Alright Everyone! Welcome Back! I just got the park back from JLWGames the other evening and we sat down and recorded the newest episode. Since I know you guys love photos. Here's a look at what he was able to do with the few weeks he had with the park. This turned out sooooooo good, guys. Really nicely done. Love the falling-apart, rustic look of Dyna-Mine. And I like where the track makes that half-loop/twist thingy and doubles back under itself.